One of our therapeutic specialties is combating narcissism. 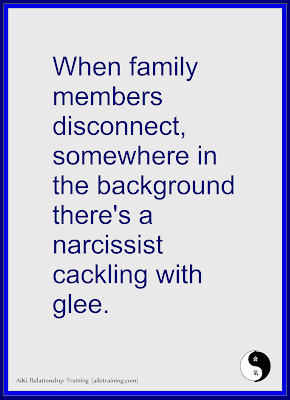 We’ve studied the behavior for years and are particularly concerned with the large number of adult children of narcissists who come in to our practice in deep pain over problems with their family of origin. What's most surprising is how many of them are only just – in their 30s, 40s, 50s, and even 60s – coming to the realization that there was something profoundly wrong with a parent they’ve idealized. Wresting with the truth that Mom is not the smartest woman in 48 states, or that Dad was actually abusive to the few friends allowed in the house is almost a revelation from heaven. In order to get their narc parent’s rare approval, children (even adult children) twist themselves into intellectual pretzels buying into the parental theses that the parent is perfect and all fault lies with other people. 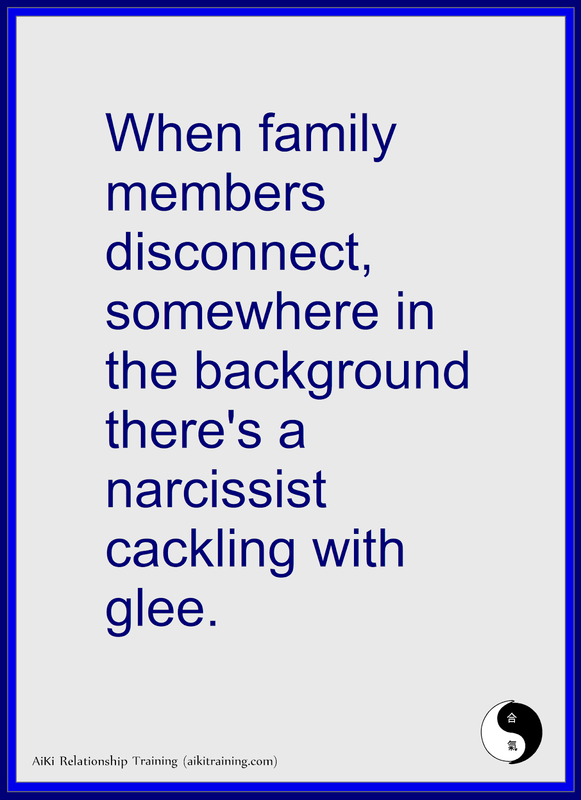 One of the greatest predictors of adult sibling or cousin disconnect is having a narcissistic parent or grandparent. That's not a coincidence. Refuse to hear any gossip about another family member. Stop confiding in narcissists, especially over your concerns about another family member. Deliberately build a one-on-one relationship with distant family members, as much as possible, by extending invitations to meet over lunch or coffee, wherever is convenient for that person. Extend invitations to gatherings, repeatedly, and without taking offense if you’re turned down the first several times. Address family estrangement by taking the blame for your former willingness to participate in the narcissist's gossip and committing to future maturity. Ask for reconciliation, with a therapist’s help if necessary. Send the request by mail so that your estranged family member has the ability to consider your bid for connection without pressure to respond immediately. If there’s no response, try again every six months or so. Be careful to accept all blame for your own mistakes, without casting aspersions on your estranged relative. There’ll be plenty of time to resolve your own hurts after the relationship is on solid footing. Want more tips on building emotional intimacy with people you love? Join the AiKi Relationship Training Institute for free by signing up here!